It is hard work, this designing and building websites, but it is very rewarding & a lot of fun! 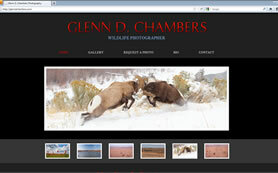 Glenn D. Chamber's new wildlife photography portfolio web design. Each and every time we wrap up a large project, we give ourselves a little pat on the back and a big high-five to our client. This time, the big high five goes out to Glenn D. Chambers. Glenn first approached us about building a portfolio website for his wildlife photography in 2011. Since then, we have gone through the creative and building processes (not to mention the revisions!) which has lead to a beautiful portfolio site. Glenn’s many accomplishments can be found on his bio page and anyone can order a print of any of the photos on his site through the Request a Photo page. We encourage all of our clients, friends and anyone else who reads this to take a look at Glenn’s inspiring wildlife photography and let us know what you think. You can visit his site at glenndchambers.com. If you or someone you know is ready to get your pride on and update or create your online presence, contact MayeCreate Design today.